Even in the fast-paced world of music software development, where variety reigns supreme and innovation is king, we can pick out trends that say something about the perceived gaps in the market. In 2010, sample library developers from around the world seemed to converge on the idea that what digital musicians needed most was a better solution for sampled strings. We saw the release of Andrew Keresztes’ LA Scoring Strings library, featuring industry-leading deep sampled divisi sections; we saw EWQL Hollywood Strings, offering a massive wealth of articulations and no fewer than five independent mic positions; and we saw the release of Cinematic Strings by Alex Wallbank — a library ahead of its time. While each of these products featured unique selling points, saw significant updates over the past two years, and went on to be very successful, today we focus our attention on Cinematic Strings, whose hugely anticipated 2.0 update offered one of the most transformative leaps in usability, quality, and value that we’ve ever witnessed. But was it enough to firmly establish Cinematic Strings as a worthy competitor to its multi-patch behemoth cousins? Join me as I explore this library in depth, showing off its true colours, detailing its strengths and weaknesses, and helping you reach a conclusion about whether or not it should be the next addition to your composing arsenal. When I called Cinematic Strings 2 a library ahead of its time, I did so because it takes a very different approach compared to the competition. Whereas others have focused on giving you granular control over what articulations you use on a patch-by-patch basis, CS2 eschews this tangle of patches in favor of a complete streamlining: there is one patch per instrument, and all articulations and features are accessible from within that patch via keyswitches and interface elements. Over the years, many of us have gotten used to the idea that if we’re going to produce a respectable string section rendering, we’ll need to dedicate several tracks in our sequencer to each section, and fine-tune the interaction between them. CS2 reminds us of the dream we all had: the ability to just focus on the music and have the library adapt to our needs, offering us the sound we’re after without the buzz killing tedium of multi-patch madness. CS2 reminds us of the dream we all had: the ability to just focus on the music and have the library adapt to our needs, offering us the sound we’re after without the buzz killing tedium of multi-patch madness. But before we delve too much into that, let’s take a step back and remember that the process of using a new library, especially one as large as CS2, begins long before you pull it into your sequencer: it begins with the installation. Along with the new 2.0 update to the software, Alex Wallbank also put a lot of effort into giving the library’s website a significant facelift. The new site is beautiful and brings you from information to checkout in a smooth and intuitive manner. Assuming you have read all about the features and been impressed by the exceptional demo tracks available, you’ll no doubt proceed to the store page, where the price will be displayed for you in your native currency. CS2 uses the ubiquitous FastSpring payment gateway to process purchases, so you’re likely familiar with the process of filling in your billing info and checking out, whether by credit card or via PayPal. The real fun part comes after, once you receive your download information. The email in question will contain a link to the special downloading software that CS2 uses for distribution, produced by Continuata. The Continuata system is popular among Kontakt library developers and is developed (like so many other music utilities) by a composer — Stu Kennedy! Once you have the downloader and have plugged in your download code, it’s time to get a coffee because it will take some time. The beauty of the Continuata system is that it not only gives you incredibly fast downloads, but it also has the ability to resume interrupted downloads, verify file integrity, and even unpack everything and clean up the delivery files for you once everything is downloaded. When you’re talking about a small file, it seems like an unnecessary extra step — why not just get direct download links? But when you consider the fact that CS2 is approximately 20GB in size and that not everyone has a reliable Internet connection, you begin to see the beauty of the system. In any case, once the library has made its way to your computer, you need only open up Kontakt, navigate to the Libraries tab, and click “Add Library”, pointing it to the folder containing CS2. Once you’ve done that (and activated it via the Native Instruments Service Center, of course), you’re ready to rock! Loading any of the five patches will present you with CS2’s entirely revamped and undeniably exquisite interface. While it may be tempting to dismiss an interface as a superficial element, the fact that it serves as your point of interaction with the entire library makes it very significant indeed — a good interface can intuitively welcome you to a complicated library, rather than scare you away or annoy you with unpredictable behaviour. Perhaps the biggest compliment I can bestow is to say that their functions are immediately evident. This seems like it shouldn’t be something worth mentioning, but one need only look at the main interface of a LASS 2.0 patch (perhaps CS2’s most direct competitor) to see how much of a difference this can make. Not only is the layout intelligently crafted, but great attention was paid to the fine details of the design, with an excellent palette of colours, subtle light and shading effects, and clear typography in place to help reinforce the visual hierarchy and ensure that your eyes never get lost searching for the particular control you’re after. 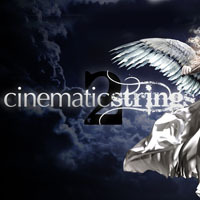 With Kontakt’s recent advances in interface flexibility, many developers have taken to creating more involved interfaces for their products, but very few have achieved a level of polish and functionality that Cinematic Strings has — and what a difference it makes! Many developers have taken to creating more involved interfaces for their products, but very few have achieved a level of polish and functionality that Cinematic Strings has. But enough about how it looks, the real question is how usable is it? To examine this, we’ll walk through the sections of the interface and explore the options along the way, discussing the impact they have on the library’s appeal and practicality for the modern composer. By default, a CS2 patch will load with the new ‘Mix’ mic position loaded, a carefully crafted blend of the 3 recorded mic positions that offers a polished, mix-ready sound right off the bat. Quite honestly, you could probably work with only this Mix position and never worry about the others for many scenarios, but because we all love to tweak and blend things into our templates, the options are appreciated. The ‘Close’ mics are not as clinical as, say, Vienna Symphonic Library’s (VSL) close recordings, so rather than sounding like they were captured in an anechoic chamber in a vacuum on a space station, CS2’s Close mics sound pleasantly detailed while retaining the liveliness of the room they were recorded in. In this regard they are very favorably comparable to LASS, whose single mic position also offers a close but not obsessively dry sound. Where CS2 begins to take the lead though, from this perspective, is in its inclusion of two more distinct mic positions. As you’d expect, they are arranged in increasing order of distance, or wetness, and so the next position is the ‘Stage’. This was actually touted as the mix-ready option when Cinematic Strings was first released, and is designed to be a balanced compromise between the crispness of the Close mics and the ambient warmth of the ‘Room’ mics. Practically speaking, it’s very likely that the Stage mics are still the ones you’ll turn to in most mix scenarios because they offer a flexible sound for writing, responding very well to a good reverb, and can easily be augmented with some Close mic precision when you’re ready to bounce out the final mix. The last option is the ‘Room’ mic position, a distant perspective that captures the sound of the hall and allows for a more realistic representation of the space than one you would be able to create artificially with reverb. Depending on how you like to blend your strings, either with the rest of your orchestra or with other string libraries, you may find that the Room mics are not used as often as the others. That said, if you’re looking to dial in some convincing spacing in your strings, then adding a bit of the Room mics into the mix can accomplish the task very transparently, at the expense of some extra RAM overhead thanks to the additional samples being loaded. Using the mic positions is dead simple, with each one having two small buttons below the fader: the left one to load the mic position, and the right one to mute it. Shift-clicking the left button will purge the samples. The faders themselves come preset at the approximate positions set up to create the Mix mic position, and above them, the little horizontal sliders will allow you to pan the samples as you like. 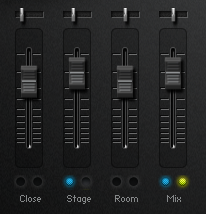 This control is appreciated, but would be even more useful if there was a way to optionally lock the panning controls together so that you could, with 3 mic positions loaded, move the entire mix without having to move each position separately. The scripting for such a function would need to be able to move each slider at the appropriate rate to keep everything aligned though, which possibly explains why it wasn’t attempted. Another thing to keep in mind is that, by default, a basic hall reverb is engaged for all patches. Controlled via the large knob on the main page of the interface, you can opt to dial this out when you’re using your own reverb in a mix. It is simply a handcrafted implementation of Kontakt’s built in algorithmic reverb that Alex has designed to sound as close to the original hall as possible, and while it is suitable for sketching, it is not a mix-calibre reverb solution. While three mic positions cannot compete with the five offered by EWQL’s Hollywood Strings, it is also fair to say that, for many of us, a line can be drawn between useful and overkill concerning the number of mic positions we can reasonably expect to make use of in a writing situation. For all but the most dedicated mix maestros, I would wager that three is closer to the mark than five. Having these mic positions is all well and good, but a key consideration when purchasing any sample library is the quality of the recordings themselves, the tone of the instruments, and the flexibility you are afforded in adapting the sound to your needs. While it is understandably a very subjective discussion, I will try to characterize CS2 comparatively, which is the way most of us will approach the problem when deciding what to purchase. CS2’s offering in the tone department is one that encourages consistency over ultimate flexibility. Rather than offering LASS’ divisi sections or EWQL’s simulated divisi and sordino, CS2 focuses on achieving an ideal representation of one particular size of string section — a modest cinematic arrangement. Compared to the competition, CS2’s string section is actually a bit smaller: 12 / 8 / 7 / 7 / 6 vs. the slightly larger sections in LASS and Hollywood Strings. This not only opens up some possibilities for faking divisi by using Close mics and several instances of a section, but it also — more importantly — means that CS2 is an ideal core library that you can blend with other string solutions to get a ‘larger’ sound, without being forced into it if you prefer a compact section size. That is not to say that it can be mistaken for a chamber group, it is simply modest by the standards of modern and romantic orchestral section sizes. The sound itself is warm, lush, and well balanced, with the interaction between sections feeling organic and convincing. The four dynamic layers (for all articulations) are uniform and transition very smoothly, with almost no noticeable ‘jumps’ or ‘dips’ in volume. While it lacks a certain rawness that LASS is known for, it compensates by being more consistent in its tuning and EQ characteristics. LASS is celebrated and mocked in equal measure for its ‘human’ performances, and while they are not particularly difficult to tame, they do require some extra massaging whereas CS2 rarely does. That said, it can be more challenging to coax a lively performance out of CS2’s more sober personality (no romantic vibratos or aggressive bow noise here). Hollywood Strings is the more direct competitor in terms of tone, and indeed the two offer a similar sound. EWQL’s behemoth, of course, offers significantly more dynamic layers, but for those who are RAM conscious and who prefer to work in Kontakt, CS2 is no slouch. Another thing that competitors offer over Cinematic Strings is con sordino recordings. This muted, beautiful sound is common for scoring work and is notably absent from CS2. Now, it’s true, LASS does not include its full complement of sordino articulations in the main LASS library (the full set is in a separate package — LASS LS), but at least the basics are included. Likewise, Hollywood Strings offers sordino for all articulations, though it’s a simulated sordino rather than actual recorded material. This may not be a huge problem for some composers, and many will engineer their own simulated con sordino patches using EQ and careful filtering, but it would have been nice to see at least some sort of coverage in CS2. 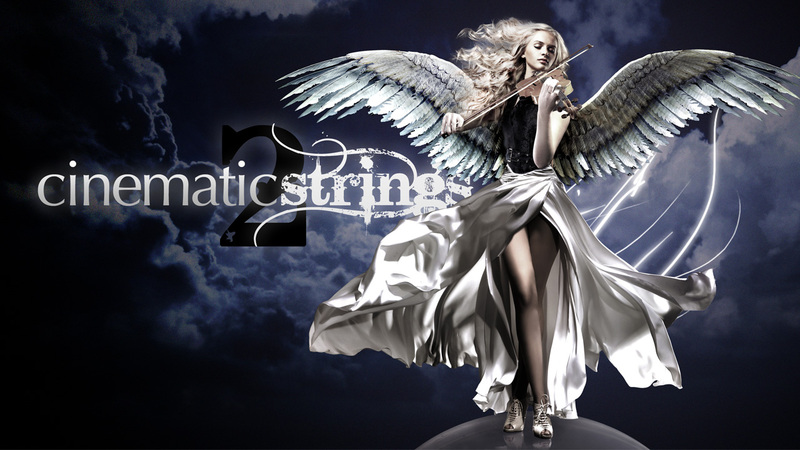 Overall, CS2’s recordings are clean and well engineered, and since strings are so difficult to accurately reproduce, many times we are left choosing between which package gives the best impression of real strings rather than which one actually behaves like them. This will come down to personal preference, but CS2 strikes a happy balance between complexity and fidelity. Many times we are left choosing between which package gives the best impression of real strings rather than which one actually behaves like them. More than almost any other feature, the number of articulations on offer is often the highlight marketing point for a sample library, for better or worse. More articulations means more sequencing options, but it also means significantly more work on the part of the developer to record, process, and program everything. With that being understood, it’s easy to see why an independent developer like Alex had to make some difficult decisions about what aspects of production to focus on, whereas a company like EWQL, with a staff and a history of products to help support it, had the ability to take on an ambitious project like Hollywood Strings and truly pull out all the stops in terms of what is offered. VSL also has that luxury, and they are celebrated for their dedication to excellence, though the dramatic leaps in sampling standards have eroded their dominance in recent years as their samples begin to show their age. This isn’t me setting you up for disappointment, by the way: CS2 certainly pulls its weight in the articulations arena and offers you all the bread & butter techniques you’re likely to use, but the reality is that the competition does overwhelm it. The reason I frame it this way is because it’s important to understand Alex’s intentions: he began by striving to solve the problem of making convincing orchestral strings accessible, and in the process — with CS2 — has created a powerful framework that he can now expand upon. Using this core architecture, it means that future articulations, or entirely new libraries (like the woodwind and brass sections that are on their way) will be much easier to develop. No more beating about the bush though — let’s examine the goods! CS2 has eight primary articulations: Arco, Tremolo, Half & Whole Tone Trills, Run Mode, Staccato, Marcato, and Pizzicato. These are all accessible via keyswitches, or the central articulations matrix on the interface of each patch. But they do not represent the limits of the library’s abilities. For instance, the Arco articulation can either serve as the standard legato performance, or it can be a polyphonic sustain patch. This is achieved with a simple flick of the Legato switch under the matrix. Either way, you can use the knob on the right to choose between High & Low playing positions, a unique feature that we’ll look at a bit later. Similarly, the Staccato articulation actually contains two different lengths: the standard staccato and a brand new (as of CS2) staccatissimo articulation that offers more agility. This system means that you are getting some extra variations on the articulations, giving you more options than are immediately evident for shaping your performance. While the majority of articulations are self-explanatory, the Run Mode is worth discussing. Achieving realistic runs without using pre-recorded performances is among the most challenging sequencing tasks. To facilitate this, CS2 introduced the Run Mode, which is essentially a legato mode that’s optimized for quick transitions. To further enhance the effect, the Live Mode switch layers in some gentle tuning drift and slurring where appropriate in an effort to enhance the sense of controlled variation between players. Like Hollywood Strings’ very similar run patches, this isn’t a magic potion that will magically create convincing runs in all circumstances, but for the majority of use cases — especially within a mix — it performs admirably. 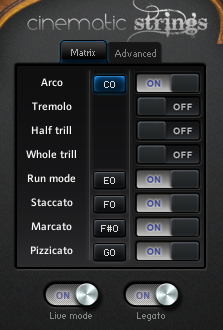 One important limitation to point out is the lack of legato transition options. While the new legato engine in CS2 is intelligent and convincing, adapting to your performance speed, it nevertheless offers only one basic legato type. In an age where we are spoiled with choice by LASS, VSL, and Hollywood Strings — each offering slurred legato, glissandos, and control over each — CS2’s lack of such options may be a serious concern to those who require them for their work and who do not have another library to layer in with CS2 for those articulations. This was a necessary compromise in order to offer other functionality and keep the project manageable, and it emphasizes the notion that CS2 does not aim to compete with the others on the basis of number of articulations. But no matter how valid the reasons for their omission, legato types are a feature that is sorely missed. CS2’s lack of legato options may be a serious concern to those who require them for their work. Where CS2 does shine is in how it integrates the articulations it offers. Rather than separating them into patches, the fact that everything is accessible from one patch means that creating MIDI performances that utilize multiple articulations becomes much easier, and achievable on a single track in your DAW (Digital Audio Workstation). This saves time, on the one hand, but much more importantly it shifts the focus from fiddling with your sequence to fiddling with the musical line itself, helping you spend your time on producing a more organic performance. While the same results are achievable with any of the competition’s libraries, the means is often something of a creative buzzkill. One double-edged sword is the handling of the double basses; their keyswitches are positioned in the same bottom octave as all the other patches, meaning that the actual playable notes are positioned an octave above their sounding pitch, as is the case on an orchestral score. Unfortunately, this is not at all the case with basically every other string sample library out there, so it’s something to keep in mind if you’re new to using CS2. While it’s great for thinking in terms of a printed score, it becomes an issue when you try to layer another library’s bass section with CS2, a task that requires some hands-on Kontakt work or other clever workarounds. Thankfully, you are able to set up your own alternate keyswitch mapping and solve the problem, albeit not very elegantly. Besides being able to change the actual keyswitch assignments to suit your preferences, you can also selectively unload articulations in order to save RAM. Re-saving patches will then allow you to create a barebones legato-only set of patches, for instance, if that’s all you’ll be using for a given track. This kind of RAM management is a crucial point to consider when deciding between libraries, so let’s make sure we address it properly. When discussing string libraries, the two major pivot points that are repeatedly brought up are tone and resource usage. Since we’ve now explored CS2’s sound, we need to take some time to discuss the issue of RAM usage and why it may not be as clear-cut as you expect. Superficially, LASS seems to win this round hands-down, but if you stop and examine (or just work with both for a while) you’ll see that this may not be such a safe conclusion to arrive at. LASS’ individual patches will all load up in a smaller footprint than CS2, and they’ll load faster. But this is because LASS is designed in an extremely fragmented manner, not unlike Hollywood Strings; LASS Full features about 200 different instrument patches, one for each articulation of each section. This gives you extremely granular control over how you build your template, but it also means you can easily end up with several instances of Kontakt just holding LASS patches. And while the new ARC features help you automate some of the individual fiddling by setting up a kind of multi within the project, you’re still wrangling a lot of patches and, consequently, a lot of tracks in your sequencer — unless you spend the time setting up a bank switching solution. As we’ve seen, CS2 has five patches. Each one is far larger than a single LASS patch by default, but no matter how you want to use CS2 you only ever have to worry about five patches. If you need fewer articulations, you simply click to unload them right from the main panel. If you want to work with only one mic position, you can deactivate any unused ones and the samples are purged — and then load them back up when you’re doing your final bounce. This uncluttered way of approaching your string section is refreshing and worthy of attention. Our final stop in this tour is a look at CS2’s most unique features, the ones that emphasize its pioneering approach to sampled strings. 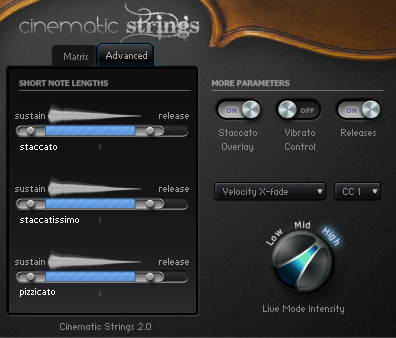 Although LASS has now been updated to include the same functionality, one of CS2’s greatest strengths is the fact that it offers you live control over dynamics, playing position, and vibrato independently — and unlike the competitors who only added that functionality in an update, Cinematic Strings (and Hollywood Strings, to be fair) was designed around this powerful control. In practice, it means that you can pick and choose which parameters you’d like to manipulate via MIDI CC messages, and construct a very organic performance that isn’t full of oddly placed vibrato and inappropriate playing positions. While the dynamics and vibrato are familiar, those who are not experts on writing for strings may not be familiar with the notion of a high and low playing position. Essentially, the playing positions determine which strings the players use to produce a note, and this in turn affects the tone quality in a noticeable fashion — high position playing tends to produce a broad, rich tone that’s perfect for romantic pads and mellow accompaniments, while the low position offers a more defined, bright tone that’s appropriate for soaring melodies and other similar uses. The Live Mode switch is also very important, and is responsible for part of CS2’s incredible responsiveness to different playing scenarios. With Live Mode engaged, intelligent scripts will automatically insert slight tuning and timing inconsistencies when you play fast passages, a feature that helps mimic the variation of a real ensemble. Of course, this may not be an effect that you like, and turning off the Live Mode switch will disable it. If the problem is merely a matter of degree, then you can flip over to the Advanced tab of the main interface and use the Live Mode Intensity knob to control how noticeable the effect is. Incidentally, this Advanced page also gives you a unique and visually intuitive set of controls for managing note attack envelopes for the short articulations, a dropdown menu for making MIDI CC assignments, and switches for the Staccato Overlay, Vibrato Control, and Releases. The first one will disable the addition of staccato notes when you play a key velocity over 60 using the Arco articulation, the second activates manual vibrato control via an assigned MIDI CC (otherwise key velocity will control vibrato intensity), and the final switch turns release trails on and off for all patches. Normally in a review like this, you might expect me to end off by telling you how all libraries are valuable and we’re all friends and how the correct one for your purposes depends on your preferences and feelings and the tides and who knows what else…but I’m not going to play Captain Obvious because that’s not helpful. Personal preference plays a part, but I’m going to do my best to conclude with a reasonable recommendation for how and when CS2 might be the correct choice. As we’ve seen, it is a deceptively powerful library with more flexibility under the hood than may be initially apparent. It has also come a long way in terms of functionality and polish since its initial release, so I urge anyone who hasn’t given it a second glance since then to look again and re-assess. That being said, Cinematic Strings also has its fair share of limitations: no legato types, no divisi, and a comparatively limited palette of articulations. I can envision two primary categories of composers who might be interested in CS2: folks who are looking for a good core string library and have none, and folks who are looking to augment their existing library collection. For the former, I feel that CS2 makes for a very strong contender for core string library, but I hesitate to recommend it unequivocally for two reasons: firstly, if the person is interested in learning to write for strings in a sophisticated fashion, then the lack of divisi and more articulations might make things difficult. The second reason seems comical, but it’s the fact that CS2 is almost too easy to use — if a composer learns CS2 very well and then decides to add another string library like LASS to her collection, the sudden eruption of patches, clutter, and extra mix overhead may seem overwhelming and unpleasant to use. Those reservations aside, CS2 undoubtedly equips a composer with all the tools she needs to produce convincing and musical string renderings across a variety of writing situations. For the second category of composer, CS2 offers a magnificent addition to the arsenal regardless of what string libraries you already have. For instance, you may not find its tone unique if you already own Hollywood Strings, but I bet being able to load your entire string section in the RAM footprint of a couple of powerful systems legato patches is appealing. Likewise, while LASS users may not be excited by the articulation spread, the gorgeous tone and multiple mic positions right out of the box offer exciting layering opportunities — and as someone who uses these two in conjunction very frequently, allow me to emphasize how marvelously they complement each other. Given all that information, I hope you feel better equipped to make a choice that’s sensible for your particular situation. Between the raw examples you’ve heard in this review, the polished demos on the website, and the final piece of music I’ll leave you with, you should have a solid sense of what Cinematic Strings can do and how easily it can be achieved. 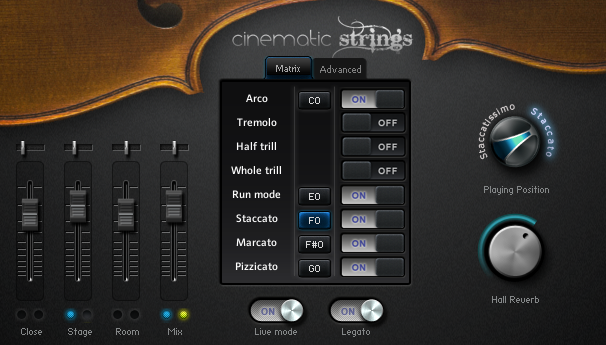 As a single be-all-and-end-all string solution, Cinematic Strings may still have some catching up to do with its more massive colleagues, but when it comes to offering a top-notch orchestral sound packaged in an unbelievably intuitive and accessible virtual instrument, Cinematic Strings is peerless. Fairly tame sound; no wide vibrato, aggressive shorts, etc. For the sake of completeness, I have tried to offer a wide spread of audio examples that capture as many facets of the library’s sound as possible. I have prepared a short phrase for each of the five sections, and then bounced it out using a variety of settings and mic positions. Because the Mix position is the default, I have endeavored to include more examples that use it than the others, which is why you will see both High and Low position performances, as well as versions with and without a bit of external reverb (courtesy of Quantum Leap Spaces). Please note that I have left the included Kontakt reverb settings intact for all Mix position examples — cues marked ‘Dry’ indicate only that no Spaces reverb was used. For all other mic position examples, the Kontakt reverb was turned off. In addition, I have written a short cue that showcases a few more of the articulations and presents the library in a style that gives it an opportunity to show off its more mellow side, since the existing demos cover the broad, epic cinematic style very well. You are encouraged to download all the audio examples (offered in MP3 @320kb/s and lossless 24-bit WAV) for private scrutiny. Thanks for this review! It’s been very helpful in helping me choose the string library I’m going to buy next. I’ve been debating over LASS Lite, and Cinematic Strings, and I’ve now decided on LASS Lite, mostly because I’m very interested in divisi writing, and the option of smaller section sizes. Even though Lite only has the full ensemble, there’s the upgrade path for when I can afford the full library. Also, from all of the demos I’ve heard of CS, including the ones here, it sounds a little to smooth and tame for me. I prefer more close/edgy string sounds (like the LOST scores, and Pan’s Labyrinth score), and LASS seems to be closer to that than CS. Thank you for such a minute and accurate review. The ease of changing articulations is the core feature for me although the amount of articulations is less. Thanks very much for this comprehensive and unbiased review. Did you remove the samples though? I tried to download the wav but got an error. I’m very glad you found it helpful — there does seem to be an issue with the download but it’s certainly not intentional. I’ll look into it and get the files back up ASAP, sorry about that! Glad that you found the review helpful! Thanks for this comprehensive review. The track you’ve done is very nice, also. Great review, and very honest. I still didn’t decide which string library I will buy. Currently I only have EWQL strings included in Goliath collection, Opus 1 of VSL and some other minor libraries. CS looks like a good choice, although I still need to investigate LASS. I love your demo too – well done ! It shows different articulations, trills etc. That was sweet demo of CS. Love your melody and dynamics. A nice tutorial. Your excellent review of CS has made my choice even harder in a good way. I’m in the process of updating my DAW setup. Along with purchasing NI Komplete Ultimate, I’m looking for a great orchestral library. I’ve researched CS, LASS, Hollywood Strings, Symphobia, VSL, The Albion sets, and others. So much to choose from. My initial budget for a library is around $1250.00 US. What would you recommend for a core library within this budget that works in Kontact? I desire a full orchestra if possible, but will be ok with just a great string library to start with. Thank you for any information you can give me. I wish other reviewers could give a detailed review such as yours. The first question you have to answer for yourself is how you write: do you need individual sections? Divisi? If so, then that eliminates Symphobia and Albion right off the bat since they’re ensemble-only libraries. Great ones, don’t get me wrong, but not appropriate for multi-part string writing. From what’s left, only LASS, CS, and the new Sable series run in Kontakt. Of those, only LASS and CS are currently complete (Sable is still being released piece by piece). With that in mind, your choice between those two comes down to whether you prefer LASS’ sophisticated features at the expense of tonal stability, or CS2’s beautiful tone and control at the expense of articulations and divisi flexibility. 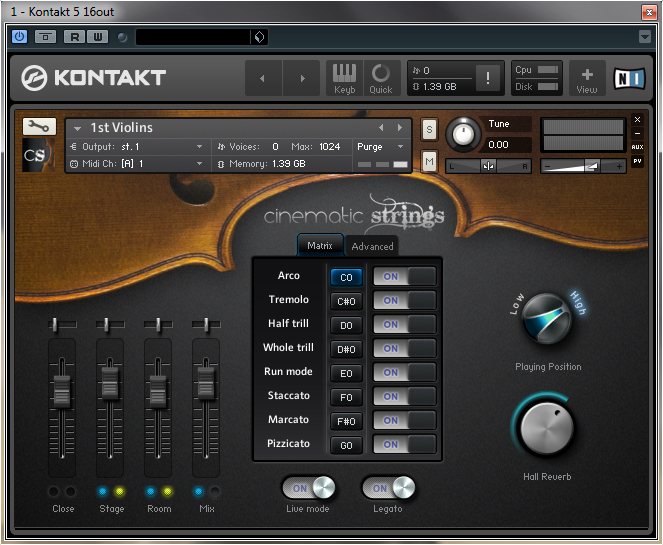 Assuming we can step outside of Kontakt, VSL’s new Dimension Strings are gorgeous, though they have the same problem as Sable — only violins and cellos are out so far! The older collections are still good, but not as deeply sampled and they’re quite expensive with that in mind. Hollywood Strings I have not personally used, but I’m a big fan of how they sound…if you can run them. I think perhaps the ideal solution for you might be to buy LASS + Albion or CS + Albion. That would keep you within your general budget range and give you both the flexibility of dedicated strings, plus the ensemble sound and other orchestral colours.